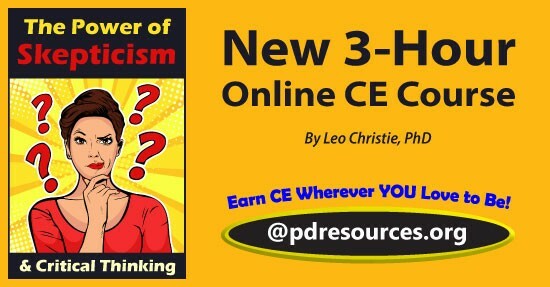 The Power of Skepticism and Critical Thinking is a new 3-hour online continuing education (CE/CEU) course that examines how positive skepticism and critical thinking are necessary in clinical practice. The history of health care abounds with treatments that persisted (although they didn’t work) for many years without ever being seriously challenged. How did this happen? More to the point, how is it that this continues to happen today? At least a part of the answer can be found in a very long list of cognitive errors, fallacies, and biases that seem to be part of human nature. Human beings are endowed with the ability to reason and the need to find connections between things and events. The problem is that we have such a strong need to find connections that we sometimes see them even when they are not there. In health care, arriving at the wrong conclusion can be an error of life and death proportions. Successful completion of the online CE test (80% required to pass, 3 chances to take) and course evaluation are required to earn a certificate of completion. Click here to learn more. Have a question? Contact us. We’re here to help! Professional Development Resources is a nonprofit educational corporation 501(c)(3) organized in 1992. We are approved to sponsor continuing education by the American Psychological Association (APA); the National Board of Certified Counselors (NBCC); the Association of Social Work Boards (ASWB); the American Occupational Therapy Association (AOTA); the American Speech-Language-Hearing Association (ASHA); the Commission on Dietetic Registration (CDR); the Alabama State Board of Occupational Therapy; the Florida Boards of Social Work, Mental Health Counseling and Marriage and Family Therapy, Psychology & School Psychology, Dietetics & Nutrition, Speech-Language Pathology and Audiology, and Occupational Therapy Practice; the Georgia State Board of Occupational Therapy; the New York State Education Department’s State Board for Mental Health Practitioners as an approved provider of continuing education for licensed mental health counselors (#MHC-0135); the Ohio Counselor, Social Worker & MFT Board and Board of Speech-Language Pathology and Audiology; the South Carolina Board of Professional Counselors & MFTs; the Texas Board of Examiners of Marriage & Family Therapists and State Board of Social Worker Examiners; and are CE Broker compliant (all courses are reported within a few days of completion). This entry was posted in CE Courses, Counseling CE, Marriage & Family Therapy CE, Mental Health, Nutrition & Dietetics CE, Occupational Therapy CEUs, Psychology CE, School Psychology CE, Social Work CE, Teaching CE and tagged CE, CEUs, continuing education, Critical Thinking, New CE Course, Online Courses, positive skepticism, Professional Development Resources, Skepticism, The Power of Skepticism, The Power of Skepticism - New CE Course by Gina Gunderson. Bookmark the permalink.